Why not become fired, indeed? 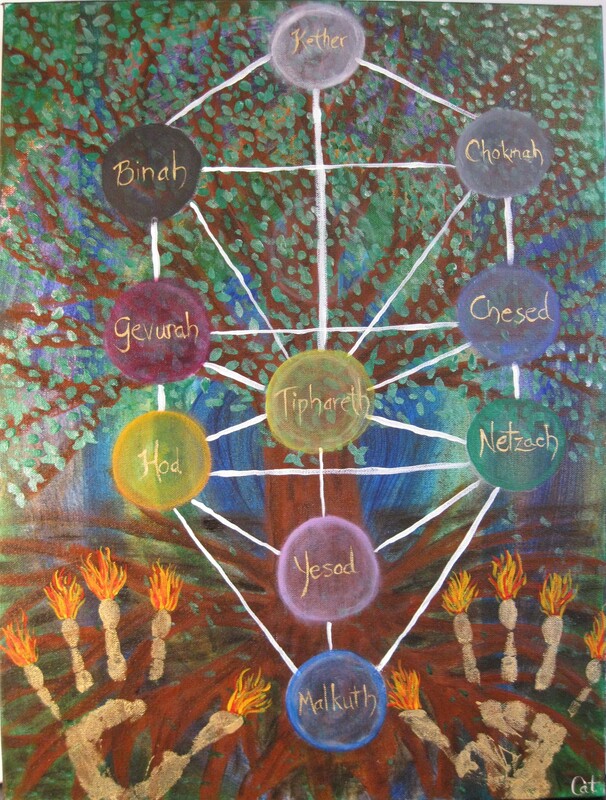 The intention for this painting is “Show me my Tree of Life, burning but unconsumed.” The story of Moses seeing the bush burning, but not being consumed, is deeply meaningful for me, because if we had the eyes to see, I believe that we could see all of the world that way. As quantum physics is to classical physics, the imaginal realm is to material reality. The regular rules just don’t apply anymore, and everything is filled with wonder and paradox. What we observe seems to be impossible, yet here it is. Although not ordinary, this, too, is a legitimate way to view reality. Truly, everything is so much more than what we see at first glance. Everyone is so much more than who we know at first meeting. Let’s just start with the fact that there is something rather than nothing. Awe-full enough! Then there are Black Holes and Einstein’s “spooky action at a distance,” Schroedinger’s cat, rainbows in every raindrop, and love. I want to know this reality in every moment, and let go of the overintellectualization and oversophistication of the cynical. I want to let the lamps of my fingers, the light of who I am, illumine what is invisible and dream of what might be possible. I leave tomorrow for my fifth year of training at Dr. Clarissa Pinkola Estes’ Mysterium. It will be a few days of travel, and five very full days illuminating what is usually invisible. Dr. E. is a poet and curandera, as well as a Jungian psychotherapist. She speaks in metaphor and story, more clearly than anyone else I’ve learned from. There is music in her language, imaging up incantations and prayers of old women. I call the Mysterium my yearly pilgrimage, because I always come home deeper and more open to wonder and possibility. I will carry all of you, my friends, with me in my heart. Oh Cat! I am ON FIRE! I don’t know if it’s all because of your article here but I know it is at least in part because of your flaming fingertips painting. You rock my world with your burning bush Tree of Life talk! My life seems chockfull of all the good ju~ju juices that make it feel like sweet honey is dripping all over me and everyone whose Life I touch as I Tra~la~la along my path with heart. Your words here sprinkle stardust magic and the Great Mystery into my day and into my heart. Hope you are having a wondrous time sitting at Clarissa Pinkola Estes’ feet and soaking in the delightful wisdom of her stories. I look forward to what you’ll blog about that Magical Mystical Journey. I am sooooo glad your Life and heart touches mine across the miles. You have so many wondrous lessons you can teach me!! Thank you for being you and scattering your stardust into my life…. your grace and kindness are so evident in your paintings, Cat..may spirit be with you in your travels…I will treasure the wisdom you will being back.